“The Boy Scouts of America has adopted the principles of Leave No Trace, which are easy to learn and apply. Every outing and activity should be conducted with Leave No Trace in mind. As young people mature, we will enjoy an increasingly beautiful environment because of the impact of their training in Leave No Trace. As members of the Boy Scouts of America, we should be good stewards of our environment through the knowledgeable use of resources. "We all must take responsibility for our decisions when we use the outdoors, and we should treat the environment with respect so future generations can enjoy the outdoors as we do today.” -Teaching Leave No Trace (BSA No. 21-117). Conservation courses are taught at University of Scouting. This 16-hour is an overnight course for individuals, ages 14 and up who wish to guide units in developing a culture that effectively demonstrates responsible outdoor choices that reduce impacts of Scouting activities. Leave No Trace Trainers, outdoor ethics guides, and outdoor ethics advisors are the backbone of Scouting’s outdoor ethics program, providing instruction to individuals and units wishing to adopt cutting-edge outdoor ethics into their unit programs. Trainers are specially commissioned to teach the BSA Leave No Trace 101 Course. 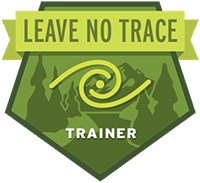 Each BSA Trainer course is taught by a recognized Leave No Trace Master Educator, so your Trainer standing is recognized nationally by BSA’s partner, the Leave No Trace Center for Outdoor Ethics. Participants receive a Leave No Trace Trainer card from BSA, BSA Leave No Trace 101 Course Guide and Leave No Trace Trainer certificate from the Leave No Trace Center for Outdoor Ethics.